Embassy means an office which officially represents one particular country in another. 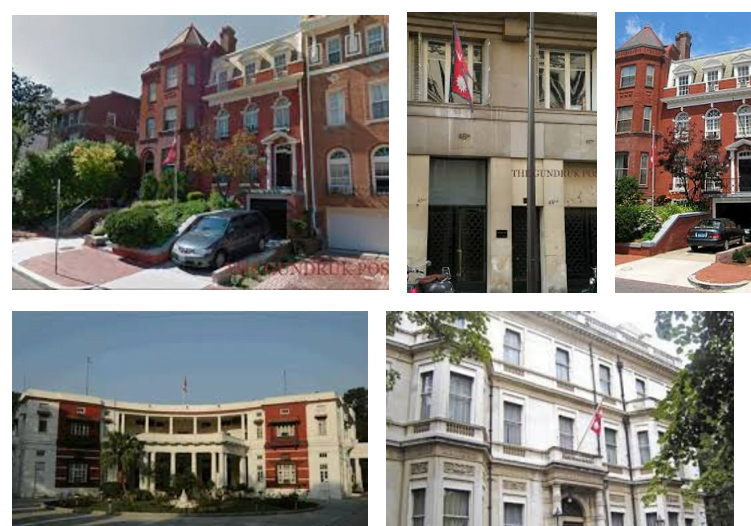 Buildings of embassies are usually established in the capital of the other countries. Embassies are the official residence and offices of an ambassadors and it also includes the mission abroad undertaken especially by the ambassador. The diplomatic talks and discussions between any two countries often take place in embassies. Nepal Embassy are on different parts of the world. Our country also has embassies in other countries. Many of us may not know where they are. Many Nepalese are often seen in the embassies of other countries in Kathmandu like US embassy, Chinese embassy etc for purposes of travel, study, work and others. In the same way, there are Nepal embassies in other parts of the world so that Nepal can undertake its diplomatic missions in other countries. Diplomatic mission in Nepal first started during the reign of King Prithvi Narayan Shah in 1769 after he established the foreign office called Jaisi Kotha. However, the progress was not made much for some years. The rapid expansion of Nepalese Ministry of Foreign Affairs took place between the years of 1950s and 1960s. Presently, the foreign affairs and diplomatic missions of Nepal have been maintained through embassies, consulates and permanent missions of Nepal in other countries in different parts of the world. The Ministry of Foreign Affairs of Nepal performs the function of formulating, implementing, monitoring and evaluating foreign policies, plans and programs of Nepal and it includes everything, right from representation and publicity of Nepal, passports and visas o be issued abroad, economic diplomacy to consular practice. There are 3 permanent missions of Nepal. One is in Brussels, European Union and other two are in Geneva and New York, United Nations. The consulate generals of Nepal are 5 in number. They are present in Kolkata (India), Hong Kong, Lhasa (China), New York (USA) and Jeddah (Saudi Arabia).